Posted by Matthias Beitl on November 22, 2015 at 17:58 . Now that you finished, please consider leaving an Amazon review? Posted by Lea Verou on November 24, 2015 at 01:02 . Posted by Matthias Beitl on November 24, 2015 at 06:44 . @cssence Thank you so much!!! Btw, love your username! Very clever. Posted by Lea Verou on November 24, 2015 at 07:12 . Posted by Matthias Beitl on November 24, 2015 at 07:48 . Posted by Lea Verou on November 24, 2015 at 07:49 . 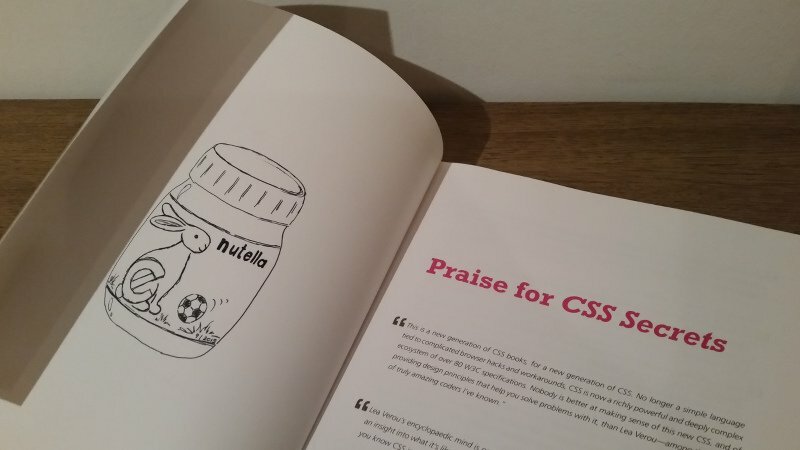 @cssence @LeaVerou Why thank you, but yours is super cool too! Posted by Chris Lilley on November 24, 2015 at 08:54 . @cssence Oh, any chance you could also post your awesome review to amazon.com as well? Thanks again!! Posted by Lea Verou on November 24, 2015 at 07:13 . Posted by Matthias Beitl on November 24, 2015 at 08:30 . @cssence Awesome, thank you so much!! Posted by Lea Verou on November 24, 2015 at 08:31 . Originally published on twitter.com	on November 22, 2015 .